Where are our future leaders? Right here. 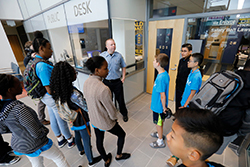 This innovative program prepares young teens for the future by introducing them to people, resources and powerful experiences that instill knowledge, confidence and determination. YEA! is a free summer program designed for 13 year olds living in Boston, Malden, Medford, or Everett whose families meet income eligibility requirements. The 2019 ABCD YEA! summer session runs from July 15th to August 2nd. The deadline for applications is June 28, 2019. Contact your nearest ABCD neighborhood location to learn more! SO MUCH LEARNING. SO MUCH FUN. Research shows that the middle school years are a critical time, especially for young people from low income families. Thirteen year olds are too old for summer camp but too young to qualify for a youth jobs program like ABCD’s SummerWorks. That’s why we created Youth Engaged in Action — YEA! It’s a free three week program offered to income eligible middle school youth that builds on their ability to become young leaders through awareness, advocacy and the opportunity to take action. Throughout the session, they learn how government works, how to take positive action on challenges that face our environment, and how financial well-being is important for them and their community. In a few short weeks, YEA! 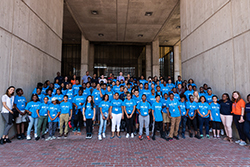 packs in workshops and field trips that often include visits to the Massachusetts State House and City Hall, where they’re inspired to become our future leaders. In addition, experts teach them how to budget money and save for the future, and they take classes on how to present themselves and practice good judgment in the digital world. YEA! youth also learn key job readiness skills and have priority admission to the sought-after ABCD SummerWorks paid internship and job readiness program. The ABCD YEA! 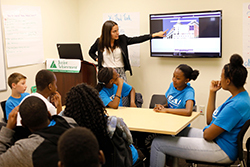 program is a collaboration with Capital One, financial education partner Junior Achievement of Eastern Massachusetts, the Eaton Vance U.S. Charitable Gift Trust, and the Prince Hall Grand Masonic Lodge of Massachusetts. Please contact your nearest ABCD neighborhood location.